Provide comfort for the family of Olga Serink with a meaningful gesture of sympathy. 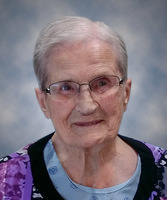 On February 4, 2019, Mrs. Olga Serink of Lamont, AB, passed away at the age of 94 years. 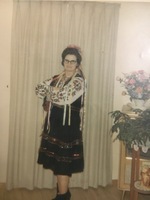 Olga is survived by her three sons and one daughter, Josephine Oginski of Edmonton, AB, Ron (Marilyn) of Kilworthy, ON, Don (Marilyn) of Lamont, AB, and Wayne (Linda) of Lamont, AB; four grandchildren, Kevin Oginski (Ellie); Crystal (Armin) Gaebe, Ryan (Melissa) Serink and Lori Haberstock; five great-grandchildren, Jacob, Brayden, Logan, Hailey and Hunter; sister, Pearl O’Kurley; sister-in-law, Susie Patan; as well as many nieces and nephews. Predeceased by her husband, Michael; parents, Pearl and John Patan; five sisters; four brothers; daughter-in-law, Judy; son-in-law, Orest; grandson, Brent; and great-granddaughter, Gabby. Divine Liturgy Saturday, February 9 at 10:00 a.m. at St. John the Baptist Ukrainian Catholic Church, Lamont. Basilian Fathers officiating with interment in the Church Cemetery. In lieu of flowers, donations may be made to the Lamont Health Care Centre, Box 479, Lamont, AB, T0B 2R0.